What does a rating mean? How many games are unrated? Do newer games get more ratings? Are games getting better over time? My database contains information on 52880 games. About 17800 of those games have no ratings at all. For the rest, at least one person has expressed their opinion about the quality of that game. Ratings are given on a scale of 1-10, with 1 being the worst possible game and 10 being the best possible game. If the ratings were evenly distributed, a mediocre game would get a score of 5. A game with a rating of 6.0 would be in the 60th percentile, slightly better than average. But the ratings are not evenly distributed. The mean rating given out is a 6.82 (median=6.95, std=0.98). People tend to rate the games they like and not rate the games they don't like. This skews the ratings so that the average game rating is 5.8. (Median 6.0, std=1.56). A game with a six-star rating may be fun, but compared to other games on BGG it's mediocre: half the games on BGG have better ratings. 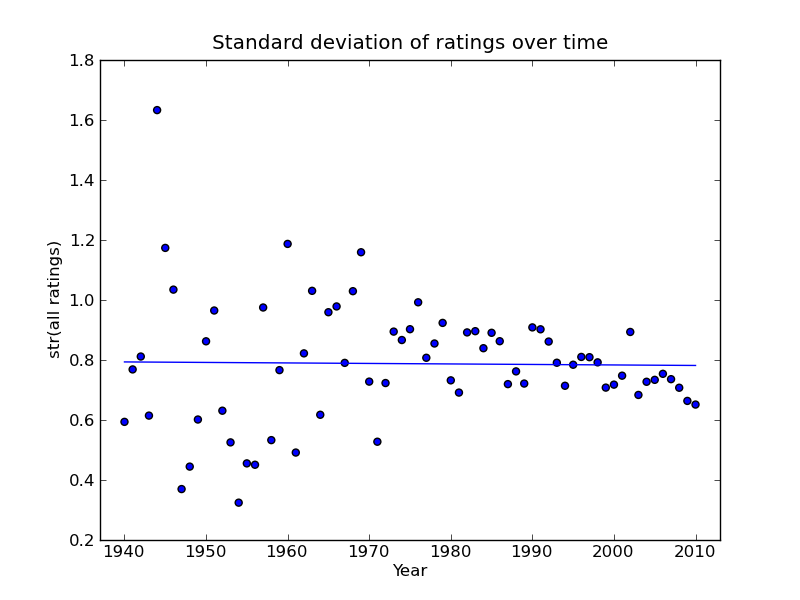 Since ratings are skewed and not distributed normally, we need some way of normalizing the data. 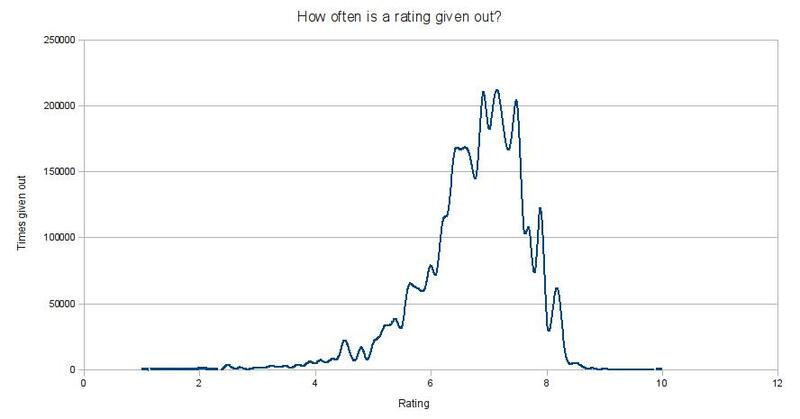 I took a tip from from Tom Moertel's work on IMDB user ratings for movies. He found that the mean movie rating was 6.2 (median=6.4, std=1.4). That's higher than the mean BGG rating of 5.8, but his IMDB rating histogram is very similar to my BGG rating histogram. Moertel presented a "decoder ring", a table that maps an IMDB rating onto a percentile. Here's a similar decoder ring for board games. You can use a game's BGG rating to get a picture of how many games are better. A game with a 7.5 rating sounds pretty good, but as you can see from this table, it's actually really good: in the top ten percent of games. Similarly, a game with a 4.75 rating sounds kind of bad, but it's actually really bad: in the bottom twenty-five percent. Although newer games are more highly rated, the range of opinion hardly changes at all, and may even be narrower for newer games. Newer games are more likely to have at least one rating than older games. 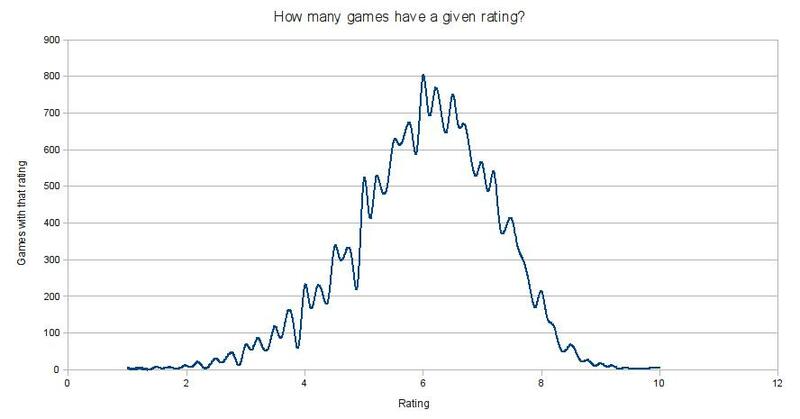 But even among games published within the past ten years, 25%-30% of the games on BoardGameGeek have no ratings. For each year with more than ten rated games, I calculated the median number of ratings a game received, if it got any ratings at all. Games published later are likely to get more ratings, assuming they're rated at all. When I was a kid, most available board games were pretty bad. Have board games gotten better over time, or is it anti-nostalgia? Here's a graph that kind of address the question. 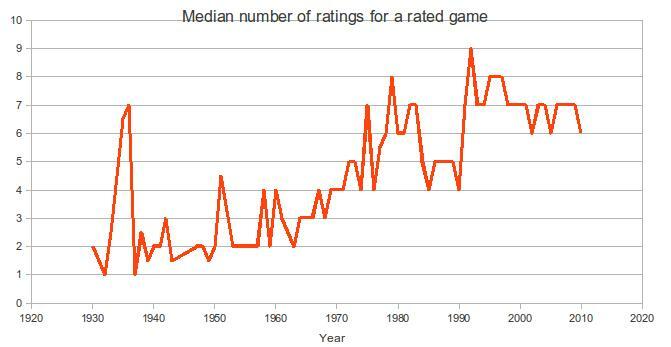 For every year containing more than 5 rated games, it shows the mean game rating for that year. 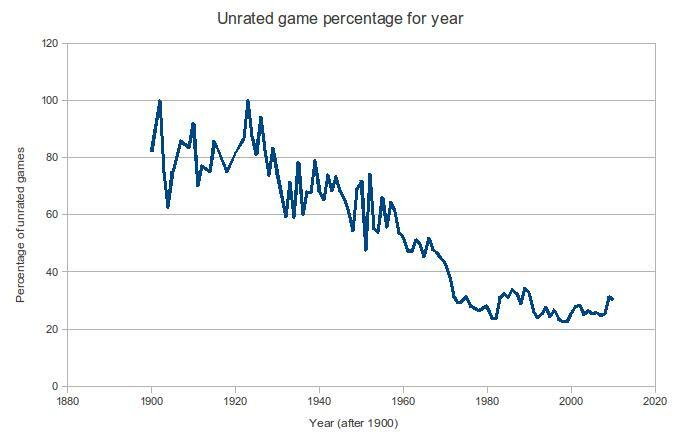 If games are getting better over time, we should see an upward trend. I included separate datasets for the novelty-driven genre of children's games, and the more conservative genre of wargames. People give newer games better ratings, because they're new and exciting. I don't think games suddenly got much better in the late 2000s, but the average rating goes up a full point between 2006 and 2010. A new game is much more likely to have a rating in the first place. On the other hand, a bad new game is likely to have a bad rating, while a bad old game is likely to not have a rating at all. Old games weren't rated when they were new (because BGG didn't exist then), so the ratings of old games reflect today's standards. This is good when deciding whether a game is still worth playing, but it's not a fair comparison. I suspect that children's games are mostly rated by the childrens' parents, and that this means systematically lower ratings than if those games were rated by their target audience. 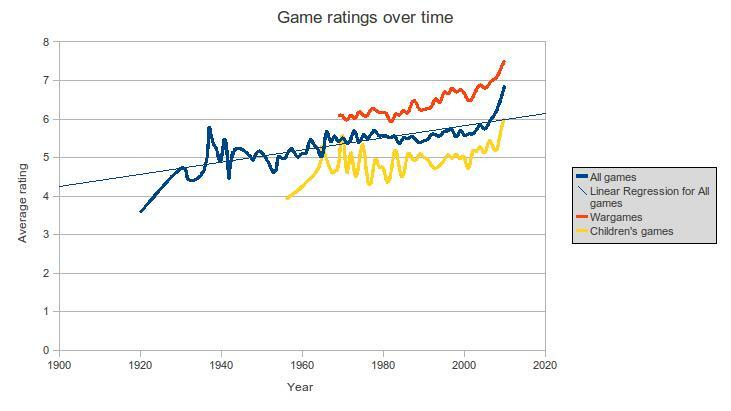 I do think games have gotten better over time, and I think this started in the mid-1960s, with the same cultural shift that put wargames on the map, but I don't think this ratings data is very strong evidence. This document (source) is part of Crummy, the webspace of Leonard Richardson (contact information). It was last modified on Monday, September 05 2011, 19:14:47 Nowhere Standard Time and last built on Thursday, April 25 2019, 10:00:36 Nowhere Standard Time.